Protects the components of the engine and provides access for checking levels. Open the front left door. 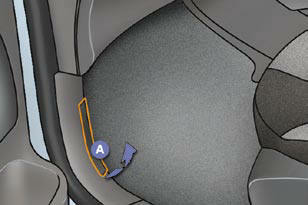 Pull the interior control A , located at the bottom of the door aperture. Push the exterior control B to the left and raise the bonnet. Unclip the bonnet stay C from its housing, holding it by its foam protection. 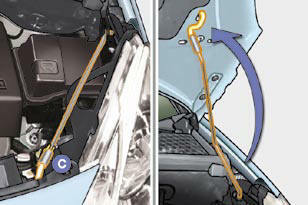 Fix the strut in the notch to hold the bonnet open. 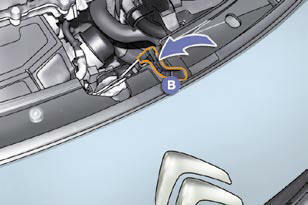 The location of the interior control prevents opening of the bonnet while the front left door is closed. When the engine is hot, handle the exterior control and the stay with care. Take the stay out of the support notch. Clip the stay in its housing. Lower the bonnet and release it at the end of its travel. Pull on the bonnet to check that it is fully latched.